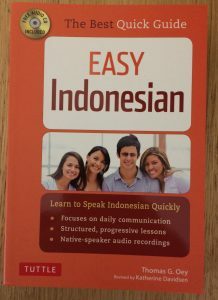 Indonesian language courses in regular evening classes are conducted in four 10-week terms per year. We have classes from beginner to advanced level. Each class has one 90 minute session per week unless indicated otherwise. 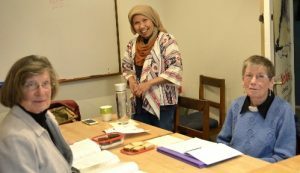 The fee for our Indonesian evening classes is $345 per term. The minimum number for our regular evening classes is five students, with a maximum of 10 – 12 students. Occasionally we have only 3 or 4 students for a particular Indonesian class. As a cancellation of classes might cause disappointment to our students, we offer these smaller classes at different rates and conditions. Classes with four students are $345 for a 9-week term. Classes with 3 students are $345 for an 7-week term. Beginners start as Elementary 1 (A.1.1) and go up to Elementary 4 (A1.4). Each of the elementary levels will take approximately one term to complete. Intermediate and Advanced levels vary. Internationally recognized examinations can be taken from advanced levels. Please talk to us for a free informal assessment of your level. We offer travel workshops especially for people who plan a trip to Indonesia and who want to get basic conversation skills. Learn how to order in a restaurant, ask for prices on markets and have a basic conversation with the locals. We can arrange one-on-one tuition and semi/private (2-3 students) at flexible times, depending on the teachers and the students availability and can be booked outside our trading hours or on public holidays. A1.1 Elementary 1 is a 15-hour course for beginners. A1.2 Elementary 2 is a 15-hour course for beginners. A1.3 Elementary 3 is a 15-hour course for beginners. A1.4 Elementary 4 is a 15-hour course for beginners.